So you love Boston Terriers, and cute things with Boston Terriers on them. There’s a lot of Boston Terrier Merchandise out there, but naturally, you only want the best stuff. But searching through Amazon’s hundreds of Boston Terrier bags takes time and effort, and no one has time for that. So to save you time, here are the best, most highly reviewed Boston purses, backpacks, and wallets for your shopping needs. And don’t you hate it when the thing you bought doesn’t look like it did online? Not to worry, we’ve included real photos from people who have shared these awesome bags, purses, and wallets on Instagram! A Julie já está de olho na necessaire novinha que ganhei da minha sister! Amei!!! ❤️? Being into Game of Thrones and being a dog lover almost go hand-in-hand… and who doesn’t love both? 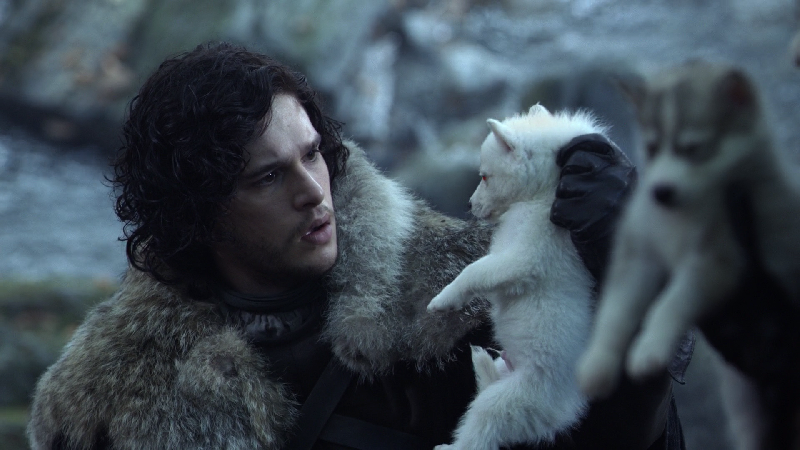 In the very first episode of the show, each of the Stark children (which the series revolves around) each get an adorable Direwolf puppy, which grow to become fierce protectors of the kids they’re paired with — a display of the human-canine bond that all dog lovers can identify with. If you’ve seen GoT, you know direwolves are very loyal and powerful animals that look very much like huskies when they are young and giant wolves when fully grown. And believe it or not, direwolves are based on an animal that actually lived tens of thousands of years ago, scientific name Canis dirus. Dire wolves lived in the Americas and were on average twice as large as the gray wolf, much like in the show. There’s no concrete evidence that the real dire wolves were ever tamed, but in Game of Thrones they stick with their masters til the end, protecting them from rivals, assassins, and jerk princes. Sounds pretty awesome, right? But you can’t actually get your hands a real direwolf like the ones in in Game of Thrones (the species went extinct long ago), but you can have the next best thing, no matter what kind of dog you have. The perfect Game of Thrones gift for fan of the show, each tag can be customized with your dog’s name and your contact info… simply fill in your information in the custom “gift message” field when you order on Amazon. Not a fan of your direwolf jingling like a reindeer in December? If dog tags aren’t your thing, you can also get a customizable dog collar to show your love for House Stark. And even if you don’t have a dog at all, but like the idea of having a direwolf, this adorable plush will have you feeling like Jon Snow. More of a fan of Daenerys and house Targaryen? Dog or cat owners with a more active imagination can pretend that their furry friends are fearsome dragons with these customizable dog tags that would make Dani proud. The next time you need a gift for your friend who’s obsessed with GoT and puppies, any of these would make a present, whether they are team Dani, or team Stark, whether that means Sansa, Jon Snow, or team Arya. As any member of an entourage knows, life is better when you experience life with a buddy a whole posse of your closest friends. With a crew who’s got your back, you feel like you can conquer the world. And when you all walk into a room together, you can’t help but turn heads and become the center of attention. With that in mind, check out these funny dog pictures that show us the true meaning of friendship and belonging. These pooches set the bar for #squadgoals we can all aspire to. We should all be so lucky to have (cute and furry) friends like these. Enjoy these group dog pics and thinking about hugging all these cute puppies! With looks like these, it’s no wonder that people are obsessed with pugs. If you’ve got a problem with one of them, you’ve got a problem with all of them. Sitting on a doorstep looking mean by yourself = kind of weird. Doing with a squad = too cool. What better way to attract attention than with a bunch of cute Boston Terrier friends? When it comes to pugs (or cute pug stuff), the more the merrier! Someone’s always blinking or yawning in the group photos! With a squad, you can always dress up like a boy band / girl group. You got your picture. Now gifts! Why scheme on your own when you don’t have to? CAN I GET A HELPING PAW HERE?! Friends love it when you show you care, whether they’ve got four legs or two. Check out these great gifts for dogs and their owners and show your buddies that you care. Pug presents for pet people!